Live video is a growing trend that we’ve all noticed on Facebook. Whether it’s your best friend showing off a vacation spot or a company streaming the ribbon cutting of its newest store, many people are experimenting with it. If you’re a marketer, you should consider incorporating live video into your marketing strategy. Live streaming is an effective way to engage an audience. According to Facebook, people comment 10 times more on live videos than on regular videos. Also shocking, people will spend triple the amount of time watching a live video than a regular video. It’s one of the easiest forms of content to create. For the simplest videos, all you’ll need is a smartphone to begin streaming. Some think that live video means less production planning. This could be the case. However, if you really want to capture your audience’s attention, you will want to plan and practice ahead of time so that when you go live, it’s the best it can be. Where you’ll save time and effort is when it comes to post-production editing. No need to edit, it’s live! Live video can be cheap. If you are creating a simple live video, it should be relatively inexpensive. Little equipment is required and few crew members are needed to film the piece. Because no special effects are used, costs remain low. Live video provides your company with a great opportunity to show off its personality. Because it’s live, it’s hard to fake authenticity. Showcasing people within your business will help potential consumers fall in love with your brand and it’s a sure-fire way to increase engagement. People make decisions based on emotion, not facts. Live video is a great way to appeal to their emotional side. Live streaming can be used in many different ways. Whether you are giving viewers a behind the scenes look at your facility, doing a product demonstration, or covering a live event, live videos can take on many forms. This allows you to test many different types of live content to see what is most effective for your business. Live videos can be used for more than just live. Once a live stream is complete, you can download the video and use it in other ways to promote your business. For example, downloading a live video and writing a blog post that builds off of the content discussed is one way to repurpose a live video. Adding this visual element to your blog posts can increase performance. Also, if you streamed live on Facebook or YouTube, that video is in your feed as long as you want and your audience can view the video anytime. “Even if your company has great people to feature and live video is consistent with your brand’s image, you’ll still want to ask one final question. 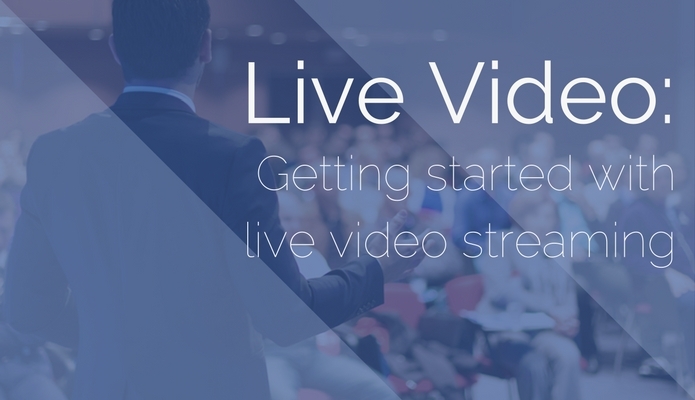 Can live video accomplish my goal?”Despite all of the reasons we’ve provided to jump on the live streaming bandwagon, many businesses are still not utilizing the platform. So, what’s the holdup? Well, the decision to engage in live streaming for businesses isn’t always a simple choice. Capable subjects – As we’ve discussed, live video is great…if you have someone or something in the video that’s entertaining. Without these engaging elements, live video can fall flat. The people you chose to feature should have energy and personality. Live video isn’t natural for everyone, so you may need to help them be their best self on camera. Proof of knowledge – Because it’s live, streaming requires your company to be truly knowledgeable about whatever is being discussed in the video. During produced video sessions, you have many takes to make sure your message is portrayed in a credible way. With live video, you only have one shot to prove to viewers that you are an expert. Things can go wrong – You’ll need to be prepared for the unexpected. Make sure everyone who is starring in the video or filming the video remains calm under pressure. Live videos must be consistent with you brand image. Although it’s live and more casual than produced video, you’ll still need to make sure live video is consistent with you brand image. Live isn’t for every company. When deciding how live video will fit into your marketing strategy, always keep in mind the steps listed above. Even if your company has great people to feature and live is consistent with your brand’s image, you’ll still want to ask one final question. Can live video accomplish my goal? Live is great for achieving some goals and not great for others. If you are hoping to increase conversion by providing an explanation of an extremely complicated product, it may be better to create a produced video that can utilize text and showcase examples of outcomes. If you are wanting to simply increase engagement and customer interaction on social, live video could be an important marketing asset for your company. Great news for those on a tight marketing budget, the majority of live video that’s created to promote businesses is self-produced. And if live video gets too complicated, you can always call in the video marketing experts!